Another of our signature services that improves your bottom line. Click here to see all we can do for you. Or call (409) 838-1605 and schedule a complimentary one-hour financial review with one of our partners. Upgrading your computer hardware or network infrastructure? We pass our hardware volume savings onto you! Call Jeff Fregia, our in-house Network Administrator, at (409) 838-1605 to get a quote on hardware and service. Can’t afford a full-time $120,000 CFO for budgeting, profitability analysis, business planning and cash flow projections? Call one of our partners at (409) 838-1605 to discuss how we can provide proactive advice and strategies to improve your business at a fraction of the cost. Has fraud, theft or embezzlement been perpetrated in your organization? Do you even know yet? Call Michael Kiefer, our Certified Fraud Examiner, at (409) 838-1605, for a Fraud Risk Assessment. Need technology to just work instead of you working on technology? Call Chip Majors, our Certified IT Professional, at (409) 838-1605, to be your bridge between business and technology. Tired of payroll compliance issues? WDJPay can prepare payroll reports and will also initiate tax payments. Call Tessa Montelaro at (409) 892-4444 for a free quote on payroll services. Using QuickBooks but not so quick at it? Need management reports to help make decisions and run your business? Call on our Certified QuickBooks ProAdvisors to answer your questions and help you get the information you need. Michael Kiefer, CPA is the Endorsed Local Provider for taxes for The Dave Ramsey Show. He will get your taxes done right and is committed to providing Biblically based, common sense education and empowerment. Contact Michael at (409) 838-1605 to schedule a consultation. Protect the assets you’ve worked all your life for. Want to learn how to be tax efficient in transferring assets to your heirs? Time is ticking! Call Troy Domingue at (409) 838-1605 for a free one-hour estate planning consultation. Is someone requiring you to submit audited financial statements? Government? Grants? Bonding companies? Call Pat O’Neill at (409) 838-1605 for a free consultation or to ask us to propose on your audit. We pride ourselves in providing professional and friendly services that assist businesses and individuals with their audit, accounting, consulting, payroll and tax needs. Your satisfaction is essential to our business and our success. 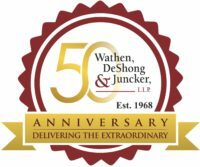 At Wathen, DeShong & Juncker (WDJ) we use a team approach to ensure accuracy, quality, and satisfaction. There is a Partner or Manager-in-Charge for every engagement. Team assignments are used to ensure that appropriate levels of expertise are maintained for maximum economy of service. Consultation with experienced staff members results in timely, cost-effective services. Management is the key to an effective organization just as it is a characteristic of any successful business. Our management calls upon well qualified, specialized staff members who maintain their positions at the cutting edge of their fields. Excellence at several levels and in various disciplines enables WDJ to more effectively serve our clients.